MOSCOW, November 30. /TASS/. The Ecumenical Patriarchate of Constantinople has been deliberately delaying the process of granting autocephaly to Ukraine because it has so far failed to win the support of other national Orthodox churches, Spokesman for Patriarch Kirill of Moscow and All Russia, Priest Alexander Volkov, has told TASS. On Thursday, it became known that the Ecumenical Patriarchate of Constantinople has failed to set the date for the unification council in Ukraine during a meeting of its Holy and Sacred Synod in Istanbul, which was held on November 27-29. "It is becoming clear that Constantinople’s actions are being delayed on purpose and have not yet produced the result that some naive people expect them to," Volkov said. "In fact, it has long become clear that Constantinople has no real possibility and no real support for its project of [Ukrainian] autocephaly," he said. "There is a Russian expression to describe the situation, which means 'to feed someone with promises.' I’m sure that similar expressions exist in the Greek and Ukrainian languages as well," the Russian church official added. Meanwhile, Deputy Chairman of the Department for External Church Relations of the Ukrainian Orthodox Church, Archpriest Nicholai Danilevich, said it was the last meeting of the Ecumenical Patriarchate this year. "Therefore, no tomos [a Church decree] on Ukrainian autocephaly was issued, nothing is known about its contents, and the date for the unification council’s meeting has not been set. Let me add that this was the last session of Constantinople Patriarchate’s Synod this year," Danilevich wrote on his Facebook page. 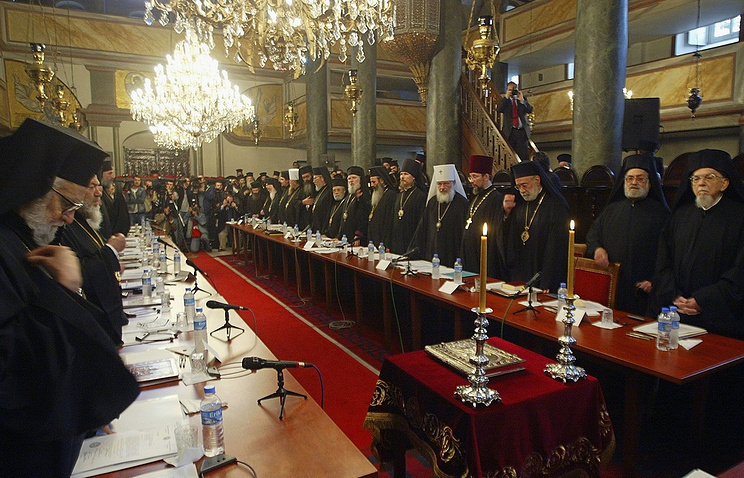 On October 15, the Holy Synod of the Russian Orthodox Church responded to the move by saying that full communion with the Ecumenical Patriarchate of Constantinople was no longer possible.